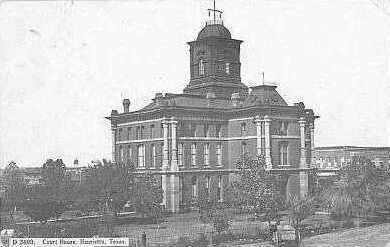 Clay County courthouse, Henrietta, Texas. 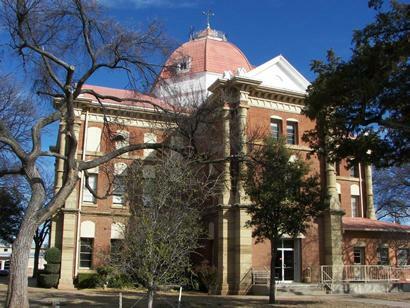 Before the alterations to the roof, the building strongly resembled the 1885 Red River County courthouse in Clarksville, TX designed by architect William H. Wilson. 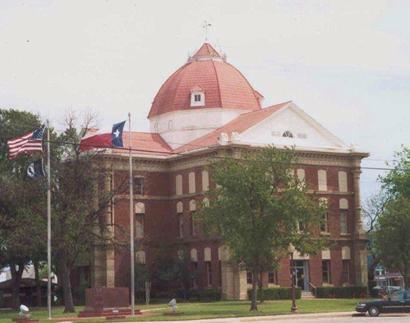 The 1884 Clay County Courthouse with the original clock tower. 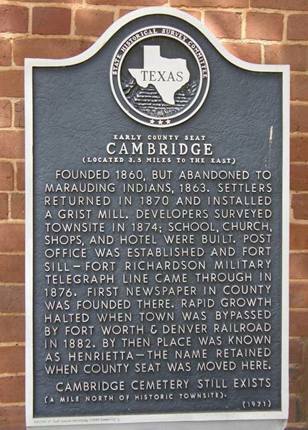 A memorial to Clay County on the west side of the courthouse square. 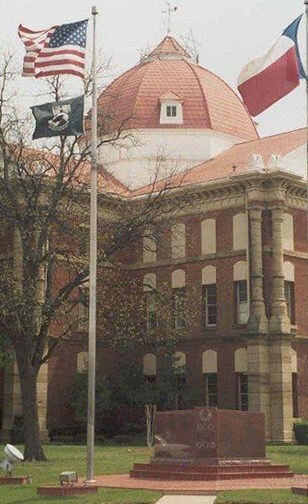 "I found this photo on the floor in an upstairs room behind the courtroom. 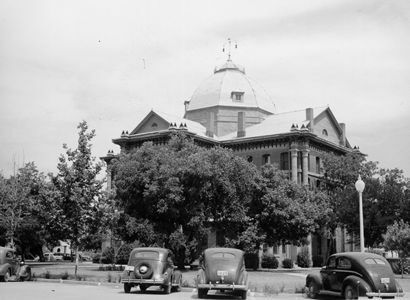 It shows the courthouse in its original condition with the clock tower intact. Unfortunately, my flash obscured part of the picture. 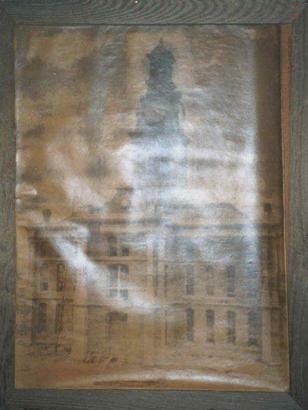 A mural in downtown Henrietta has a rendition of the courthouse based on this photo." I have greatly enjoyed many "fantasy vacations" employing your website. 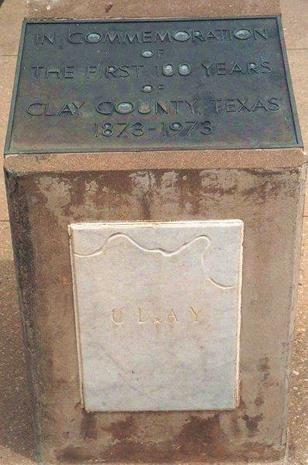 I grew up in Clay County, and in fact most of my family still lives there. 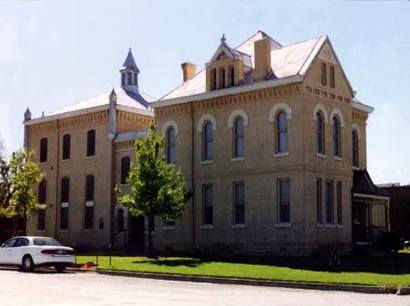 The county courthouse is the central figure in the largest social event in the county: Pioneer Reunion, held every year in September. 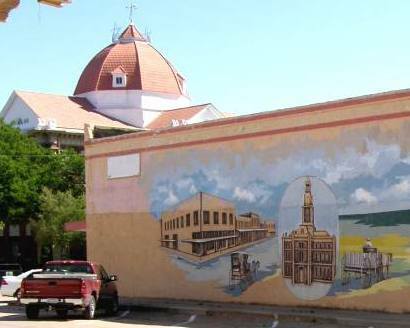 There are arts and crafts booths on the courthouse square and a float parade on Friday and Saturday mornings that passes on both sides of the courthouse, not to mention the fiddling contest in the old bandstand, and heaven only knows what all else!